A female student, of 12 years old, presents to the Sports Podiatrist with Shin Splints in both legs. The child’s mum explains that her daughter enjoys netball and middle distance running and has been complaining of leg pain for 9 months. The pain in her legs came on gradually, as the patient increased her number of sports sessions at school and she has had no previous foot pain, ankle pain or symptoms like Shin Splints before. The child reports to the Sports Podiatrist that in the beginning, the Shin Splints was painful after sports, but that more recently it was painful during the activities. The pain was now severe enough to render the patient unfit to play netball or carry out any sporting activity. Her condition would only allow approximately 5 minutes of running before she would have to pull up and stop, and cease activity. The child’s mum went to see her regular GP who quite rightly diagnosed Shin Splints and recommended that she seek treatment from a Sports Podiatrist. In addition to the Shin Splints that this patient was enduring, she also reported to the Sports Podiatrist that she would feel a sharp knee pain in both legs. The pain in her knees had been apparent for approximately 3 months and was once again evident during sporting activity. The knee pain was around the patella, the knee cap, and felt like a burning pain underneath the knee cap and behind it. The Sports Podiatrist carried out a physical examination which involved palpation of the muscles and tendons of both lower legs and shin bone, the tibia. Shin Splints is a generic term that refers to pain in the lower leg area but does not necessarily describe pathology of the exact muscle, tendon or other tissue. Upon palpation of this patient’s lower legs, it was clear that the pain was coming from the Tibialis Posterior muscle and tendon – along the medial / posterior shaft of the tibial bone. Calf muscles were also tender and tight, which limits ankle joint dorsiflexion. Peroneal and anterior muscle group were unremarkable. The Sports Podiatrist confirmed to the patient and her mother that she did in fact have Shin Splints, but more specifically, Tibialis Posterior tendonitis. This pain is due to inflammation of the muscle which is usually caused by stress and strain of the muscle itself. On palpation of this patient’s patella and patella tendon there was a jump response and pain was reported. It was clear that the knee pain felt during running and netball was due to inflammation of both structures – Patella tendonitis and irritation to the posterior surface of the knee cap. In order to determine the cause of this patient’s Shin Splints and knee pain, it was important to observe her walking and running on a treadmill. The Sports Podiatrist drew bisection lines on the foot and leg and used digital software to record her gait cycle. She was observed bare foot so that her natural foot function could be assessed. It was clear during the replay of this patient’s video that she in fact had a stable foot type that displayed minimal pronation. Her heel stood up quite vertically and did not evert to a degree that caused concern. The foot and leg were fairly well aligned and there was not a degree of tibial angle, in relation to the foot, that was of concern. The patient’s foot posture index measured zero degrees, in both feet. In a relaxed calcaneal stance position her arches stood at 31mm left and 33mm right, confirming a pes cavus foot type. There was also an early heel lift during gait which would indicate calf tightness and a limited range of ankle joint dorsiflexion. In this case, it would seem that the cause of the Shin Splints was an overload of the Tibialis Posterior muscle, due to an early heel lift – which is caused by the calf tightness. This tightness in the calf muscles is common in the pes cavus foot type and would have been exacerbated by the running and jumping in netball. Sports that involve quick and lateral movements and being on the toes will work the calf muscles and this can lead to tightness. 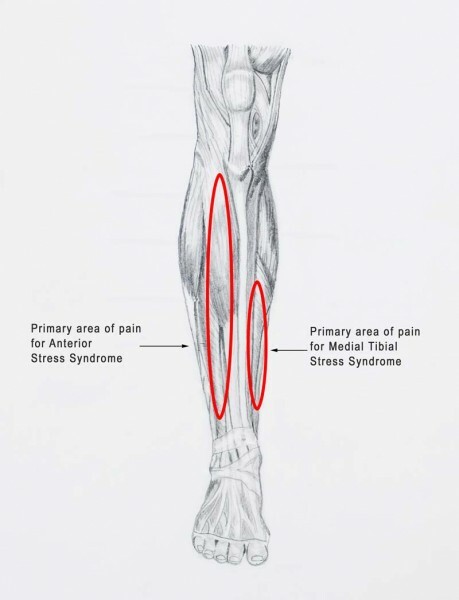 The Tibialis Posterior muscles fire early and become strained or inflamed, and this is one form of Shin Splints. The Sports Podiatrist explained this to the patient and her mother and advised that calf muscle treatment would be important. The tightness in the calf muscles and the early heel lift also affects the knee joint and was likely contributing to the knee pain. There is more load on the knee in a flexed position in this situation. Furthermore, the jumping in netball adds extra load to the knee joint, the patella and patella tendon in particular. This can lead to inflammation due to irritation and the Sports Podiatrist explained that this is a common cause of knee pain. In this case, the treatment would be quite simple. It was explained to the patient that in order to resolve the Shin Splints and the knee pain she must improve the range of motion in her ankle joint by stretching her calf muscles. The Sports Podiatrist applied some dry needling techniques which involved the use of acupuncture needles into the calf muscles and she was advised to perform calf stretching 3 times a day. She was referred to a physiotherapist for some soft tissue release and some calf muscle massage. The knee pain would resolve quickly with the use of cold packs which were to be applied each night for 30 minutes before bed. The ice packs were also to be applied to the Shin Splints along the medial side if the tibia too. This patient was treated once per week for 4 weeks and dry needling was applied to the calf muscles at each appointment. At the 4 week follow up the patient had been compliant with stretching and massage therapy with the physiotherapist. Her calf range was measured using the knee to wall technique and an improvement was noted. Palpation along the Tibialis Posterior muscle did not cause a jump response and the patient did not report any pain. Palpation of the patella tendon was also unremarkable. The patient was advised on a careful re introduction to physical activity and she was asked to return to the clinic to see the Sports Podiatrist if her Shin Splints or knee pain returned. It should be noted that this patient refrained from all physical activity during her 4 week recovery period. This case study should not be taken as general advice. If you or your child has Shin Splints or knee pain there may be a different cause and a different treatment, and you should seek the advice of a suitably qualified Sports Podiatrist.